Here in the OC we have "ski week." It's a week off of school to go spend some time at the ski resorts. Well, with Mike working there was just no way that I could follow that trend with all three kids and the dog. So we took the kids to see Hotel for Dogs on monday. Wednesday I braved Disneyland all by myself with all 3 kids. Mike always drives when we go and I never pay any attention to where we are going so it took me about 30 minutes to find the parking lot. The kids were so helpful, they pointed out every street sign just in case it was for the parking. We eventually made it to the tram which was quite the adventure in itself with 3 kids, a diaper bag, and a stroller. We worked up quite the appetite getting to Disneyland, so we got some lunch, then hit the rides. On the way out of the park we got a churro and then made the long trek out of the park to the car. The kids were so great, the waited patiently in line, didn't run off from me, and were so helpful with Bentley. I couldn't be more blessed to have these three as my children. 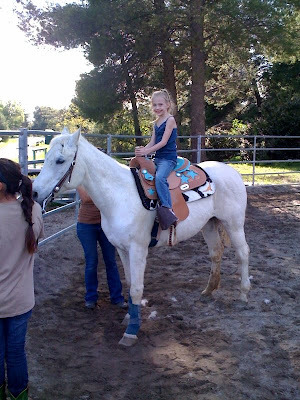 On Friday the kids had their very first horseback riding lessons. First the kids got to turn Teddy out and chase him around. 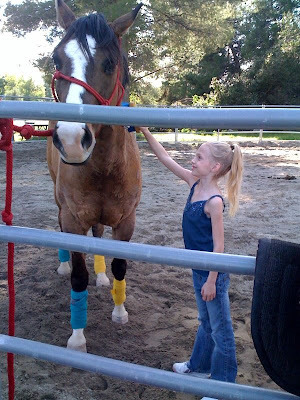 Then they had to make him come to them and put on his halter. 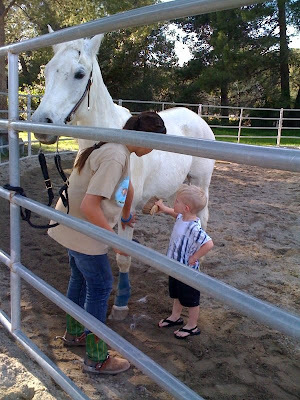 Then they learned how to groom him and put on his saddle. Then they finally go to ride. 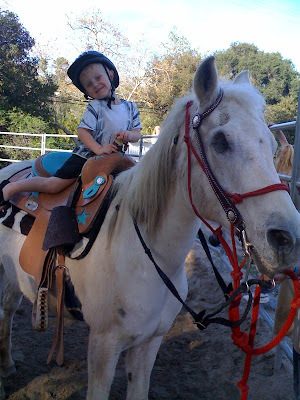 The kids rode a horse named Blue, who is a white Arabian mare with one eye. She is the sweetest Arabian I have ever met. Bentley was pulling her nose and smacking her and she didn't even care. The kids had so much fun and can not wait for their next lesson. 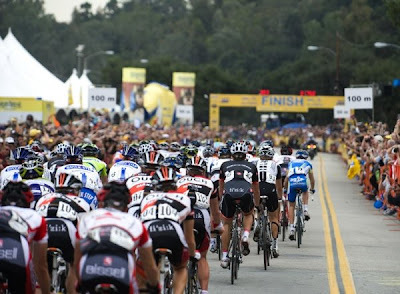 On Saturday we went to Santa Clarita to watch the start of the 7th stage of the Tour of California. 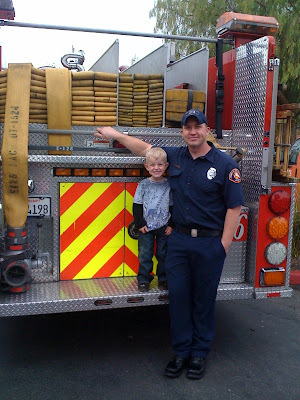 We went and saw all of the tour busses and police cars and fire trucks that were there to. 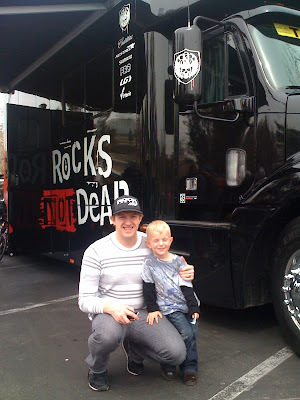 Perry got a tour of a fire truck, and then him and Dad checked out the Rock Racing Tour Bus. Perry thought it was very cool because it had skulls on it. After the start we headed to Pasadena to watch the finish. The kids complained that they didn't see the riders very much because they were to fast. Bentley waved and clapped everytime they ride by. She probably thought all of those people were there to see her though. She is such a little entertainer. Chris Baldwin, Rock Racing Today we went to church and then came home and took naps to recover from our very busy week. We had so much fun this week but now its time for the kids to get back to school. Wow, how fun! I want a ski week. 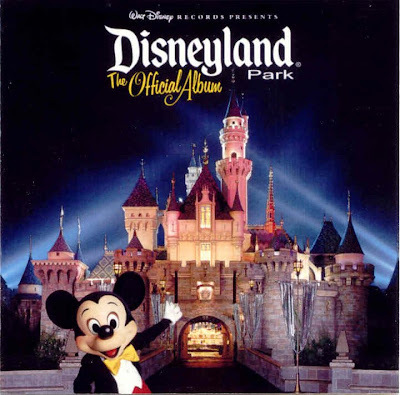 It looks like you are staying busy with the three kids, I think that is very impressive you treked through disneyland by youself with those kids. So are you ever going to come up here to visit? I think I should tag along with Richard and Jeanne in March! Looks like a blast!! Glad you had fun!! Miss you and will see you soon girl!